Pitchers are often advised to “mix it up.” Without some variations in speed and movement, pitches will become virtually routine to even a mediocre major league hitter, no matter the velocity or break. I have much the same feelings toward smoking cigars. A heavy-duty La Flor Dominicana Ligero is a different experience when you smoke it after a diet of CAO Golds and Ashton Classics than it is when it caps a week filled with sticks like Cain and El Cobre. I was struck by this recently after purchasing a box of one of my favorites, Pete Johnson’s Havana VI torpedoes, the Aristas. They’re great cigars and I’ve liked each one I’ve smoked. But after cracking open the box and smoking them for a week or so straight, I felt something missing. I went to other cigars for a few days before selecting another of the Aristas. And, as you no doubt expect, I found that experience more enjoyable. Now, I know there are cigar smokers out there who light up the same cigar time after time. Virtually any retailer can tell you about customers who come back regularly and pick up a box of, say, Montecristo or Davidoff Aniversario. If they’re out of stock, the smoker will grumble and refuse to try something else. And I’m not saying there’s anything wrong with that. After all, if there’s one golden rule of cigar smoking it’s that you should smoke what you like, whether it’s a Black & Mild or La Palina. My aim is just to put another possibility out there, a suggestion that I believe could enhance smoking enjoyment. It applies as well to someone who smokes only one type of cigar—such as strong or mild, Nicaraguan puros, or Cubans. If you mix it up a bit, I think you’ll find your favorites can be even better. Not to mention the likelihood of discovering some new cigars you like. What’s the worst that can happen, you get one cigar you don’t like? So, the next time you’re in the humidor to select a cigar, listen to the pitching coach. 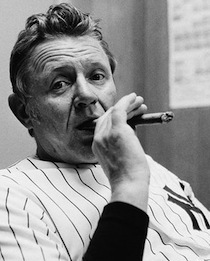 (The late former catcher and manager of the Yankees, Red Sox, and Tigers, Ralph Houk, (pictured above ) would say the same thing.) Mix it up. Excellent point. While my cigar rotation is generally in the medium-full range, a milder one often impresses me with its smoothness and I find it a very pleasant smoke. I also find a day without a smoke generally enables me to have a much greater sense of the flavor nuances of a cigar smoked the day after. I hate to have a cigar-free day, but sometimes due to logistics, it's unavoidable. The silver lining to that day is the full flavor of the next day's cigar. I haven’t smoked a “flavored” cigar since the early days of my cigar obsession, used to smoke Al Capone rum and cognac flavored, that’s about it. Nice article. Great job Cheers !! !